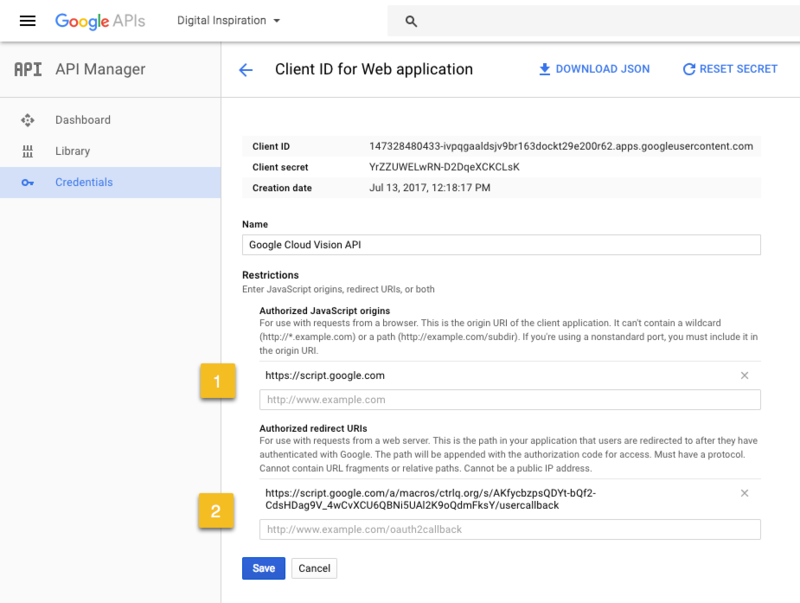 This sample applications will help you understand how to interact with the Google Cloud Vision API using Google Apps Script. To get started, create a new Google Script. Go to Resources > Cloud Platform Project > View API Console and enable the Google Cloud Vision API. For the Authorized Redirect URIs, go to the Script, run getGoogleCallbackUrl and you will find the URL inside the logs section. Save the Oauth2 Client and make a note of the Google Client Id and the Client Secret. Put them in the storeGoogleCredentials() function, run the function to save the credentials in the property store and then remove the values from the script. Publish the script as a web app and open the app URL in a new tab. It will require authorization once and then store the refresh token in the property store. If you get an invalid_scope error saying “You don’t have permission to access some scopes. Your project is trying to access scopes that need to go through the verification process.” – you’ll have to submit a request using our OAuth Developer Verification form. The access token is stored in the cache as it is valid for 3600 seconds and a new token can be requested using the refresh token. Now that our basic setup is in place, we can make a call to the Cloud Vision API with a simple HTTP POST request. The authorization headers should include the bearer access token. The refresh token will remain valid until access hasn’t been revoked by the user. And here are a couple of helper utility functions for accessing the cache and property store. The access tokens expire every 60 minutes. You can also make an HTTPS POST or GET request to the tokeninfo endpoint to know about the validity, scope and expiry of the token.